This series combines eight products at a fantastic price. It includes five Instructor's Guides with corresponding Student Materials. The Instructor's Guides are self-contained spiralbound books with measurable objectives, lesson plans, assessment forms, and reproducible step-by-step activity illustrations. The Student Materials set is a classroom-ready, hands-on complement to the five Instructor's Guides. Features a total of 624 laminated cue cards and a handy Pocket Book. The redesigned multimedia Picture Cue Dictionary Software matches the card illustrations, combining text and speech with an easy-to-use interface. Ideal for developing functional vocabulary, reviewing lists of things to do, or printing out additional cue cards. Large Communication Book: This new manual communication tool gives you a lot to talk about! The three 3 x 3½-inch transparent pockets per page can hold a single communication choice or multiple options. It's easy-to-open and lays flat until you turn each page with the big tabs. Personalize with photos, symbols or student-made material. Twelve sturdy vinyl pages, spiralbound. Size: 11½ x 4½ inches closed. Updated Version! Over 700 illustrated word cards combine text and speech in an easy-to-navigate program. It's divided into five word lists: daily activities, housekeeping, personal care, mealtime, and shopping. Hold 32 standard business card-sized cards of any kind to create any sort of book or list you can think of. Simply slide the cards into any of the 32 vinyl pockets. Fast food, table service, cafeteria or meal planning at home. Select-A-Meal includes an instructor’s guide covering step-by-step dining at fast food or table service restaurants, school cafeteria or home! 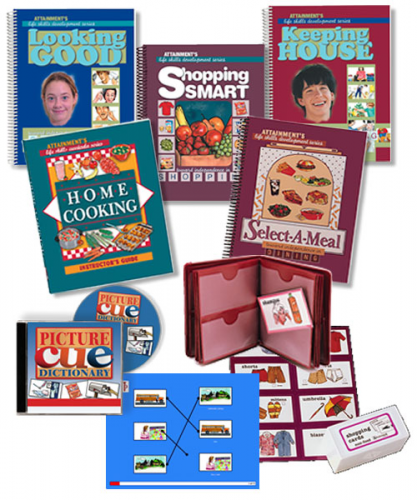 Shopping Smart includes an instructor’s guide featuring illustrated reproducible step-by-step sequences of grocery and department store shopping, plus related skills like planning for shopping, dressing right and unpacking purchases at home.